Create this beautifully designed Matzah cover for an elegant addition to your Passover table. 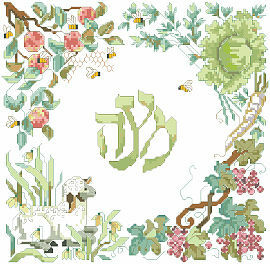 The Hebrew word for Matzah is encircled with symbols of spring and many of the meaningful elements from the Seder plate. This cross-stitched Matzah cover will be a cherished heirloom to be enjoyed year after year at your family Seder. large easy to read chart with instructions included for making the three pocket design. Contents: Stitch Count 119w X 116h: Finished size on 14ct 8 1/2" X 8 1/4"